Protein Gel Stains Low-cost, quick, convenient and easy-to-use protein gel stains. Protein marker bands not visible with the Lumitein™, One-step Lumitein™, or One-step Lumitein™ UV gel stains. Use of pre-stained protein markers can quench lumitein fluorescence. Switching to an unstained marker should resolve the issue. Can the Lumitein™ Protein Gel Stain be used for staining native PAGE gels? Lumitein™ is a luminescent dye designed for detecting proteins in SDS polyacrylamide (SDS-PAGE) gels. It can also be used to detect proteins in native PAGE gels after an additional SDS incubation step as described in the protocol (PI-21002). Lumitein™ is a luminescent dye designed for detecting proteins in SDS polyacrylamide (SDS-PAGE) gels. It can also be used to detect proteins in native PAGE gels after an additional SDS incubation step. The stain combines excellent sensitivity, exceptional user-friendliness and compatibility with common instruments and downstream analysis. It is as sensitive as the best silver stain by detecting 1 ng or less protein (Figure 1). Unlike silver stain, however, Lumitein™ has a linear detection range of at least 3 orders of magnitude. It is among the simplest protein gel stain by staining protein in gels in 90 minutes or less time without a separate fixation step. Lumitein™ has an excitation spectrum that makes detection possible with either a simple UV box or fluorescence laser scanner. Moreover, protein gel staining with Lumitein™ is compatible with downstream protein analyses such as mass spectrometry and Edman-based sequencing (Figure 2). 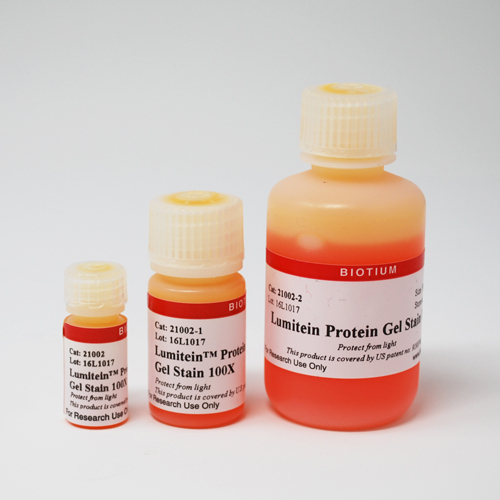 Lumitein™ Protein Gel Stain 100X is an economical concentrated stock solution. Lumitein is also available as a convenient ready-to-use 1X staining solution (catalog no. 21001). For a fast, easy, and non-toxic alternative to Lumitein™ for protein gel staining, see our One-Step Lumitein™ and One-Step Blue™ Protein Gel Stains. Highly Sensitive: At least as sensitive as silver stain by detecting < 1 ng protein. Simple & Fast: Fixation and staining in a single 30-90 minute step, followed by a simple rinse in water. Instrument Compatibility: Image with 300 nm UV gel box (EtBr filter), Dark Reader, or a laser scanner. Wide Linear Detection Range: At least three orders of magnitude. Compatible with Downstream Analysis: Compatible with MS and sequencing. Highly Stable: Both 100X and 1X solutions are stable at room temperature. Figure 1. Two-fold serial dilutions of protein marker were separated via SDS-PAGE and then stained with Lumitein. Imaged with a GE Typhoon Trio using 532 nm excitation and 610BP30 emission filter. Figure 2. 2-D gel of human liver protein lysate stained with Lumitein. The three circled spots were picked for MS analysis by Applied Biomics, Inc. (Hayward, CA), confirming that Lumitein staining is fully compatible with MS analysis. Figure 3. PAGE gels containing electrophoretically separated protein marker (loaded in two-fold serial dilution from left to right) were stained with Lumitein total protein gel stain (left) and Coomassie Blue (right), respectively. Lumitein-stained gel was imaged using a UV box equipped with EtBr filter (UVP) while the Coomassie-stained gel was imaged using a white light converter (UVP). 1. Meth Mol Biol. 869, 621 (2012). 4. Environ Microbiol 12, 2190 (2010). 5. Can J Microbiol 55, 304 (2009). 6. Res Microbiol 160, 401 (2009).